The Men’s Gathering has been sponsored by the Men’s Council of Washington since the first Gathering was held in 1990. The Gathering, that became affectionately known as Buffalo Gap was held at Buffalo Gap Camp, Capon Bridge, West Virginia from 1990 through 2008. ~ Since 2009, our annual Gathering has been called the The Chesapeake Men’s Gathering. ~ Because Buffalo Gap Camp was no longer available, from 2009 through 2011, our Gathering was held at Ramblewood Resort, Darlington, Maryland. ~ In 2012 through 2015 our Gathering was held at Camp Round Meadow in the Catoctin Mountain National Park near Thurmont, Maryland. 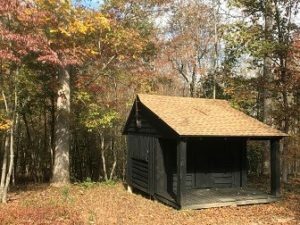 ~ In 2016, and again in 2017, we gathered in Cabin Camp 5 in the Prince William Forest Park (in our Nation’s National Park system) near Triangle, Virginia. Edward Honnold, a licensed clinical social worker with a practice in Washington, started the Men’s Council. After investigating a number of men’s organizations in the Washington area in the mid-1980’s and attending gatherings, such as the annual Minnesota Men’s Conference, Ed organized the first Day for Men in Washington in 1988. It featured both Robert Bly and Michael Meade as guest speakers. Soon after this, Ed began to hold monthly meetings of the Men’s Council at the Ethical Society of Washington, located on upper 16th Street, NW. Ed assembled a planning team of five or six men who developed programs of interest to men, focused mainly on the ideas of mythopoetic men’s movement of which Robert Bly was a well-known advocate. Each month, the Council presented an experiential program dealing with some issue of significance to men. Many men brought their drums to the monthly meetings and played them before the meeting began. Each meeting had an opening ceremony that helped men center themselves that included a ritual in which men gave their names and were welcomed. The experiential program followed, sometimes including singing or ecstatic dancing, with time to socialize afterwards. For those men who attended, it was a highlight of the month. The Men’s Council had few rules: all men were welcome to attend; all men pledged that personal disclosures of other participants would not be repeated outside the meetings; there was freedom of speech, and peaceful resolution of differences. Men were encouraged to relax their judgments and take risks in self-disclosure. By 1991, regular attendance at the meetings had grown to 150 men. The meetings were characterized by a very high level of energy. In 1992, Ed put together the second Day for Men in the Washington area. Robert Bly was an important presenter. This event was a tremendous success and supplemented the treasury of the Men’s Council so that it was in a good position for years to come to fund the annual start-up costs for the Men’s Gathering. By 1992, a number of the men who had been most closely involved with the Men’s Council formed the core of those who brought the New Warrior Training Adventure (NWTA) [Mankind Project] to Washington, D.C. area. Over the next few years, many men who attended the Council participated in the NWTA as a next step in their personal growth. Many of these men decided not to continue attending Council meetings in favor of strong men’s groups called Integration Groups that are offered as a follow-up to the NWTA. By 1993 or 1994, there was a shift in the energy of the Council toward a more structured approach to meetings. By this time, the mythopoetic men’s movement as a whole was no longer as popular as it had been in years past. As a result, attendance gradually eroded at the monthly Men’s Council meetings so that by the late 1990’s the meetings were no longer attracting enough men to make it feasible to continue. With the exception of a few special meetings held over the years, in part to test interest in a resumption of monthly Council meetings, the annual Men’s Gathering has become the sole activity of the Men’s Council of Washington, DC.